The true acetabulum may be shallow with full contact with the femoral head or partly connected with a false acetabulum or severely small, shallow and triangular with complete loss of congruency with femoral head . Limited bone stock and usually anterior acetabular segmental wall defects. Bone stock is usually rearranged posteriorly related to acetabulum [6, 7]. Version deformities of the acetabulum; up to 1/3 are retroverted [6, 8, 9]. Insufficient coverage of femoral head from acetabulum. Anteversion of the iliac rim . Femoral hypoplasia with loss of metaphyseal flare . Narrow and straight femoral intramedullary canal [11, 12]. Marked femoral anteversion and torsion and short neck [10, 13]. Coxavalga and lower offset . Posterior position of the greater trochanter [6, 13]. Proximal femoral deformity from previous osteotomies [10, 13]. 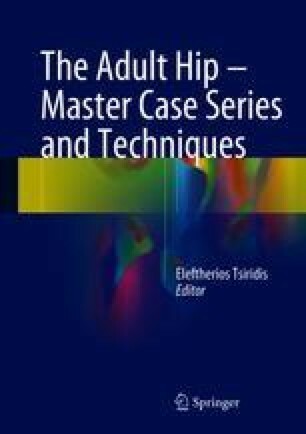 Distorted hip biomechanics with shortening and deficiency of abductors, flexors and extensors due to persistent dislocation . Abundant soft tissue (capsule and ligaments) .